Echo is another entry in Jack McDevitt’s run of far-future antiquarian mysteries, in which antiquities dealer Alex Benedict and his pilot/aide du camp Chase Kolpath unravel a long-buried mystery. This time around, the mystery involves a stone from the former estate of one Somerset Tuttle, best known for devoting his long life to searching for intelligent alien life, in a galaxy humanity has been roaming for thousands of years and in which only one other intelligent life form has been found. The stone contains markings that don’t conform to any known human script, but before Alex and Chase can procure it, another party makes off with it. The other party turns out to be Rachel Bannister, who had been Tuttle’s lover up until the time they both walked away from their quest – and she walked away from her job as a pilot – with Tuttle dying in a boating accident a few years later. Alex and Chase pull on the slender threads of the mystery before finding out what really happened. 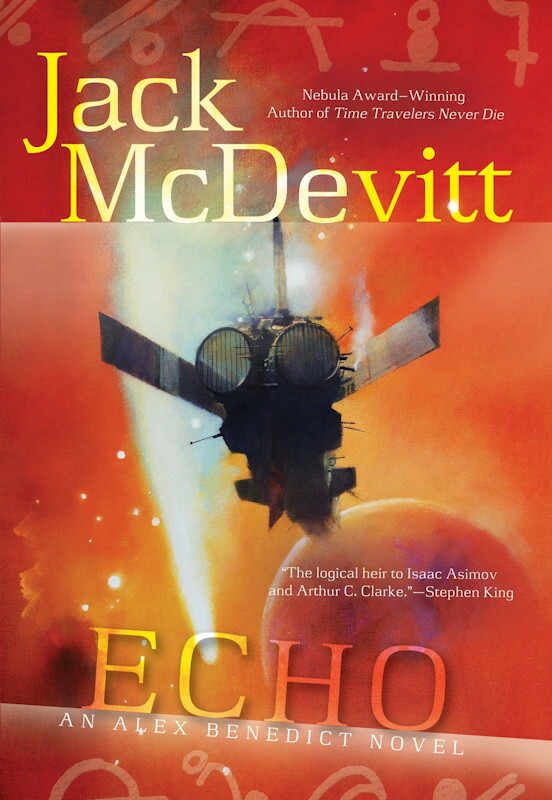 I’ve discussed what I think are the failings of the Alex Benedict series in earlier reviews (low tech universe, somewhat superficial story), and Echo doesn’t really remedy those flaws. Clearly, the series is what it is. Yet I keep reading it, and indeed I devoured this book in just a few days (quite rapidly, for me! ), so just as clearly, I enjoy it despite the fact that McDevitt clearly isn’t going to overcome its limitations and produce another A Talent For War. The success of Echo is partly the suspense of who’s trying to stop Alex and Chase in their quest (and whether they’ll succeed), and partly the fundamental question, did Tuttle find aliens or didn’t he, and if he did, why didn’t he announce it to the universe? McDevitt does a pretty good job of resolving this mystery satisfactorily – if anything, he underplays his hand in the last few chapters, robbing the climax of some impact. And the last third of the book is a fairly rousing adventure exploring the star system our heroes’ quest takes them to. It reminds us that, fundamentally, they’re amateurs at this “brave new worlds” thing, surviving by their wits and the skin of their teeth. Alex in particular is far more at home dealing with people than with environments or animals (and Chase is only slightly better). If you enjoyed earlier volumes in the series, then you ought to like this one.